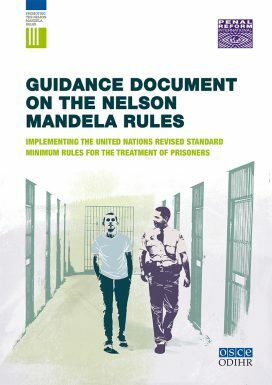 Produced by the OSCE Office for Democratic Institutions and Human Rights (ODIHR) and Penal Reform International (PRI), this document provides guidance for implementing the revised UN Standard Minimum Rules for the Treatment of Prisoners, known as the UN Nelson Mandela Rules. The Guidance Document is the result of a joint project by ODIHR and PRI that is designed to assist states in implementing the new Rules, so as to protect the right of people deprived of their liberty to be free from torture and other ill-treatment. The revised Standard Minimum Rules were adopted unanimously by the UN General Assembly on 17 December 2015. The revised Rules are now known as the ‘Nelson Mandela Rules’ to honour the legacy of the late President of South Africa.